Posted on Feb 15th | Written by Industrial Refrigerated Systems Ltd. The cost of heating an ice rink can account for up to more than half of operating expenses. Keeping ice rink spectators warm while ensuring that the ice is kept cold can be a challenge. As this article discusses, balancing the heat load with the refrigeration load in your ice rink chiller is key to balancing your budget. Radiant heaters help provide that solution. Ice rink owners are constantly searching for ways to lower energy costs. While using localized radiant heaters is an increasingly popular strategy, knowing when and where to use them is key. Creating and following a space heating operations policy can extend overhead cost savings considerably. The most effective space heating operations policies center around two interdependent factors: minimum air temperature and maximum spectator capacity. The more people in a facility at a given time, the warmer the air temperature. The heating policy should ensure enough heat is provided to keep the overall air temperature above 5 degrees Celsius, and the number of spectators present comfortable. 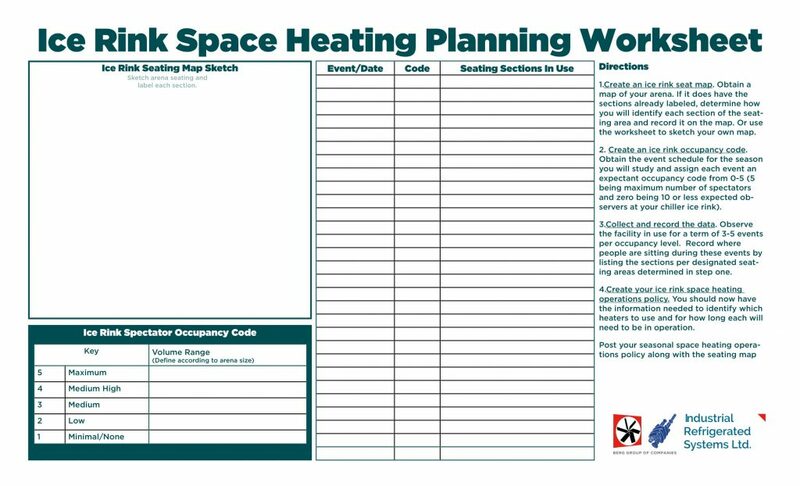 Rather than guessing or arbitrarily assigning seating sections for space heating, we recommend starting each season by conducting the research and creating a space heating plan based on your findings. Create an ice rink seat map. Obtain a map of your arena. If it does have the sections already labeled, determine how you will identify each section of the seating area and record it on the map. Or use the worksheet to sketch your own map. Create an ice rink occupancy code. Obtain the event schedule for the season you will study and assign each event an expectant occupancy code from 0-5 (5 being maximum number of spectators and zero being 10 or less expected observers at your chiller ice rink). Collect and record the data. Observe the facility in use for a term of 3-5 events per occupancy level. Record where people are sitting during these events by listing the sections per designated seating areas determined in step one. Create your ice rink space heating operations policy. You should now have the information needed to identify which heaters to use and for how long each will need to be in operation. Post your seasonal space heating operations policy along with the seating map in a visible location for staff. IRSL works to provide ice rink chiller owners and operators with the information and service they need to keep their refrigeration systems operating efficiently. Please contact us for more information on tips and strategies to keep your rink operating at its peak performance.